a. 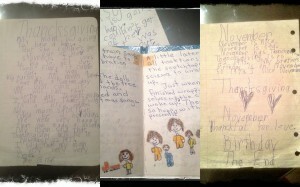 “Thanksgiving” – I was seven years old when I wrote this in the first grade. 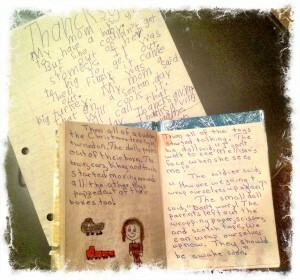 The only point I remember about the assignment is that we were told to write something about Thanksgiving. I associated Thanksgiving with my brother’s birthday as he was born around this feast, and I was recalling the special Thanksgiving when my mom was pregnant with my bro. To this day, I joke with him that my story about Mom having a turkey indeed came true. 🙂 This is one of my first full-length “papers.” Embarrassingly apparent is my lack of spelling skills – thank goodness I grew up relishing spelling bees and Speak & Spell (true story!). My message about writing is this: write every.single.day. Writing is a release. Writing is an expression. Writing is an extension. Writing is a connection. I learned this from these very first pieces and I continue to discover more about myself and about the writing process each day. It is a gift to take full advantage of. When you cannot write, read. When you cannot read, write.